Wireless Lifestyle, one of the largest Sprint Authorized Retailers in the nation hired Bishop-McCann to plan and execute their 2018 Pinnacle Club Trip for more than 150 attendees. The Pinnacle Club Trip is Wireless Lifestyle’s annual incentive trip to reward top performing associates. This event is an opportunity for associates to network with one another along with the Wireless Lifestyle top event sponsors and executives. Pinnacle Club XI, 2018 was Wireless Lifestyle’s 11th annual event. Wireless Lifestyle’s primary goals for Bishop-McCann when planning the trip was to bring a fresh creative flare overall to the event as it was previously held year after year in Las Vegas. Bishop-McCann’s tasks were to support the logistics of taking this group out of the country for the first time, reduce costs as event quality and attendance increased, Increase ROI, and exceed internal client satisfaction scores. 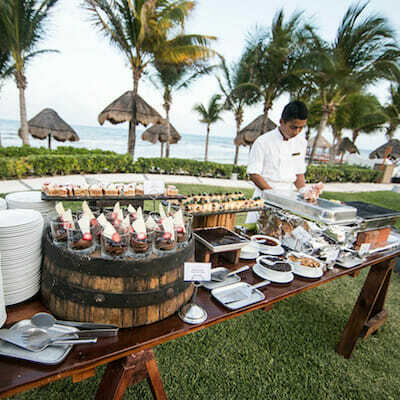 This four-day event was framed by warm crystal waters on the Riviera Maya coastline at Secrets Silversands Riviera Cancun. The venue was a beautiful sugar sand beachfront resort combining style and sophistication ensuring the delivery of the perfect combination of business meetings, group activities, recognition, competition, award presentations, networking, and FUN! Bishop-McCann provided a dedicated program management team to partner closely with the Wireless Lifestyle event marketing team. With the attendee experience as the primary focus, our account team flawlessly executed each program component including hotel sourcing and negotiation, guest accommodations, overall event management, event production, food and beverage management, décor, and ground transportation. Bishop-McCann’s program operations also worked closely with Secrets Silversands Resort to create a welcome reception, general business session, group activities, awards dinner and a farewell party that not only aligned with the incentive program strategy but also engaged, inspired and motivated the audience. Bishop-McCann also made sure event sponsors were highlighted appropriately and partnered with the resort to give attendees a discount at the world-class spa. Bishop-McCann delivered the program on budget and successfully executed the first event for this group in an international location receiving only positive feedback.